If you are the type to read quickly and to try to digest as much information as you can, then you need to read this quote. In this selection from Charles Bridges we see him reading my mind and seeing right through to my heart. Ardent minds wish, and seem almost to expect, to gain all at once. There is here, as in religion, "a zeal not according to knowledge. "— There is too great haste in decision, and too little time for weighing, for storing, or for wisely working out the treasure Hence arises that most injurious habit of skimming over books, rather than perusing them. The mind has only hovered upon the surface, and gained but a confused remembrance of passing matter, and an acquaintance with first principles far too imperfect for practical utility. The ore of knowledge is purchased in the lump, but never separated, or applied to important objects. Some again need discretion in the direction of their study. They study, (as Bishop Burnet remarks in the conclusion of his history) books more than themselves. They lose them-selves in the multiplicity of books; and find to their cost, that in reading as well as "making books there is no end; and much study is a weariness of the flesh." Bishop Wilkins ob¬serves,—There is as much art and benefit in the right choice of such books, with which we should be most familiar, as there is in the election of other friends or acquaintances, with whom we may most profitably converse. No man can read every¬thing; nor would our real store be increased by the capacity to do so. The digestive powers would be overloaded for want of time to act, and uncontrolled confusion would reign within. It is far more easy to furnish our library than our understanding. I am one of those who fools himself into thinking that learning by osmosis is actually possible. If I just surround myself with the things I want to learn, they will find a way to seep into my skin and become a part of my soul. Of course, Bridges brilliantly speaks as a man who has been there. 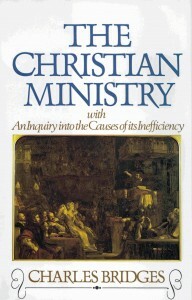 I highly commend his book The Christian Ministry to you. I am currently working on an eBook version of the book which should be available in the Amazon Kindle store shortly. Adam, I'm excited to hear about your project. I, too, have started working on that book, but then the project stalled. My hang up was that Bridges' footnotes are pure gold most of the time, and I wanted to make the footnotes accessible, but I was torn on how best to do that. I have the beautiful print edition that you've used in the picture. It is one of my treasured books (although, I must confess, I have not finished it yet). I'll get stuck on a page thinking about the implications of what he's saying and then I won't make it any further. I'm actually stripping the footnotes. I don't think they are original with Bridges, however. I believe that they are editorial additions, though I'm open to correction. I haven't studied the history of Bridges enough to know for sure. where did you hear that? When I was browsing the footnotes, I thought I saw a couple which referred to the author in the third person, which is pretty much my sole reason for thinking they were added by later editors. Far from a scholarly argument, I'm afraid. Can you tell what page this quote is on (in the book pictured, not the ebook)? No, I can't BlueDog, because I don't actually have the one pictured. Mine is from an 1844 edition, so the pages wouldn't be right. Maybe some other enterprising reader can. I can say that it comes from one of the chapters on the pastor in study. Did Del Toro Change His Mind, Mid-Series?